Erhard E. has been experimenting with capturing, analyzing, reverse engineering and then transmitting new ASK/OOK signals with his RTL-SDR and Raspberry Pi running RPiTX. 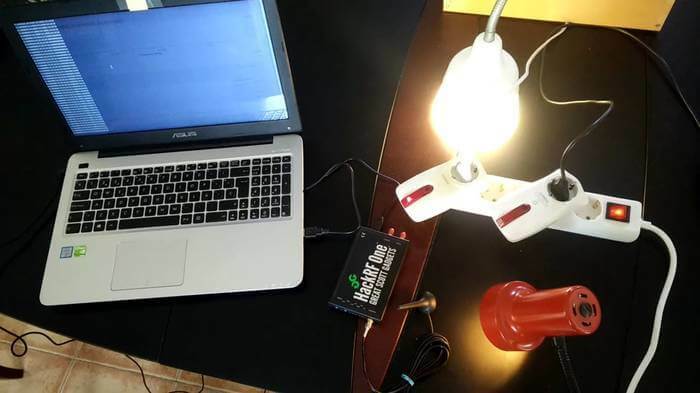 Erhard has written a very informative guide/tutorial (pdf) that explains how he did it for wireless doorbell and for remote control toy cars. RPiTX is software for the Raspberry Pi which allows it to transmit almost any signal via modulation of a GPIO pin. RPiTX related posts have been featured on this blog several times in the past. First Erhard records a copy of the doorbell signal using his RTL-SDR and then views the waveform in Audacity. He then writes that you’ll need to find the waveform characteristics either manually using Audacity, or by using the rtl_433 decoder. In the tutorial he uses rtl_433 which automatically gives his the pulse width, gap width and pulse period. Next in order to actually generate the signal using RPiTX he uses the waveform characteristics that he found out and manually creates a .ft hex file that describes the signal to be generated. Then using using the rpitx command, the .ft file can be transmitted. Later in the tutorial he also shows how he performed the same reverse engineering process with a cheap RC car toy (forward/reverse commands only), which uses OOK encoding on the wireless controller. The tutorial can be downloaded in PDF form here. 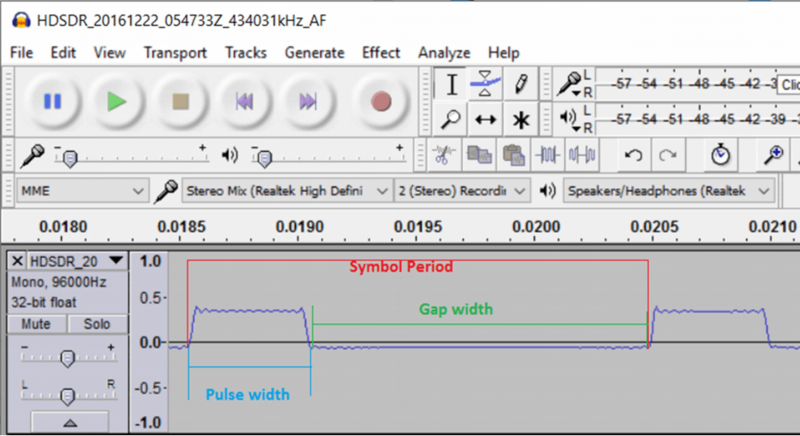 Showing the Pulse Width, Gap Width and Symbol Period of a signal in Audacity.